A universal, single, shingle pouch sewn from a durable nylon. 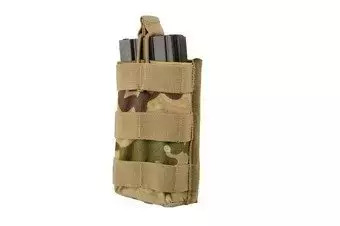 The pouch stores a single M4/M16 (STANAG) / AK / G36 magazine. 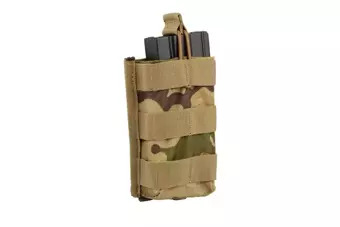 The magazine is secured against falling out from the top by an elastic shock-cord.The pouch is compatible with MOLLE webbing system, which means it can be attached to all kinds of vests, belts and backpacks. Good pouch, especially for the price. It has a rubber-ish coating on the inside which is really nice. Water drain hole on the bottom is nice as well. Aviable in all sorts of camo's and it's got Molle all over. 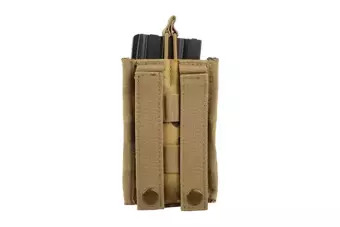 My M4 type mags fit a little tight. I dont' see myself speed loading mags from this pouch, but at least they dont fall out. Looks good and mags fit well . 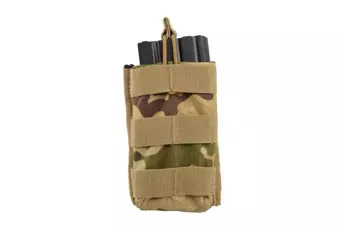 Nice pouch,i´ve got mounted four of these on my vest, they are a bit hard to fit first, but if you adjust the lace a bit it will become smooth and easy. I´ve yet to see a better open pouch option than this, and i doubt there even is one! Very nice pouch for the price. Little bit hard to get Magazines in. But they will "stretch" over time. Perfect for m4 chargers. Also worth grenades thunder b. Cheap pouch but very good quality for price and handy! Good product, good material! The rubber is very strong and short. It takes a small mods. Perfect mag pouch, good material! Good pouch, good material. But very hard to get mags in and out, the cord for the open top tag was to short, and couldnt get mags in or out without using two hands, so had to make mods, and at that without the mods, reloading one handed would take about 1-2 min. Now can be done in 2-4 seconds with the mod I done. Which was adding more cord. With that mod, I also am able to use Ak 5.45 mags ( 74 mags ) but with some difficulty getting it back in the pouch but can be done. May have just been my pouches I got. Will also work great with 5, 45 style AK mags. Just two words about this coyote pouches.... Cheap and very good.